Changi Airport Uses Pokemon - And It's Super Effective! It’s been established – Changi Airport is more than just a transitional location for Singaporeans. We’ve already covered the ways that the Airport, or rather, its team, has won over our hearts (sometimes even without trying), and a Pikachu parade this morning just proved the point even more. Changi Airport has jumped onto that bandwagon, and revamped its terminals to cater to Pokemon fanatics and just anyone who loves cute things in general. Following their Star Wars promotion via exhibits, events, and exclusive plush toys last year, Pokemon comes as a tie-in of sorts this time with its annual Christmas decor. 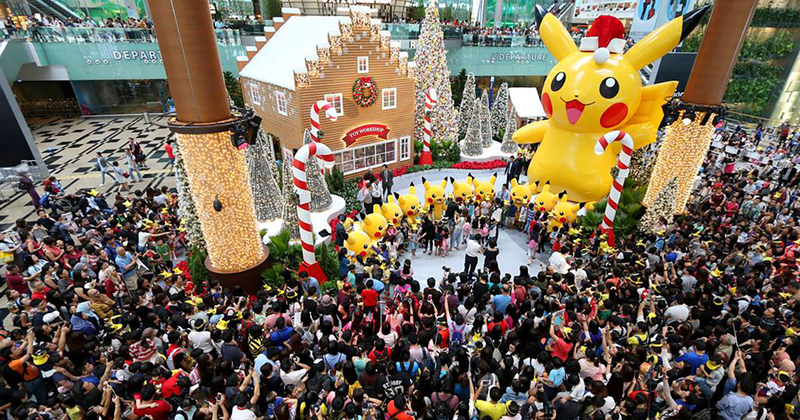 Aside from exhibits, Christmas trees decked with Pokeball baubles, the sale of absolutely adorable Pokemon plushies, and meet-and-greet sessions with Pikachu, there’s also a “Poke Trail”, which will bring visitors around the Airport. The official launch event came in the form of a Pikachu Parade (the first in Singapore), and happened at around 10:30am this morning. And from the Facebook live video taken by the Changi Airport Group, it definitely attracted many fans – albeit it technically being work day. Within a few hours of its posting, it has garnered over 8,900 likes, over 900 comments and over 2,900 shares – a feat only possible with a cultural phenomenon like Pokemon. The PokeGO hype may have fizzled out, but judging from the response to Changi Airport’s initiatives so far – the love for Pokemon is still far from dead.